This photo of McDavid and Draisaitl is taken during the National Anthem. McDavid missed half of his first NHL season with a broken clavicle, but has made the All-Star game every year since. Draisaitl has played some amazing hockey through his first three full seasons; finally Draisaitl will have his time to shine at the 2019 NHL All-Star Game. Draisaitl was voted into the NHL All-Star game during the “Last Man In” vote, which is the final player voted in for each conference, as per voted by the fans. 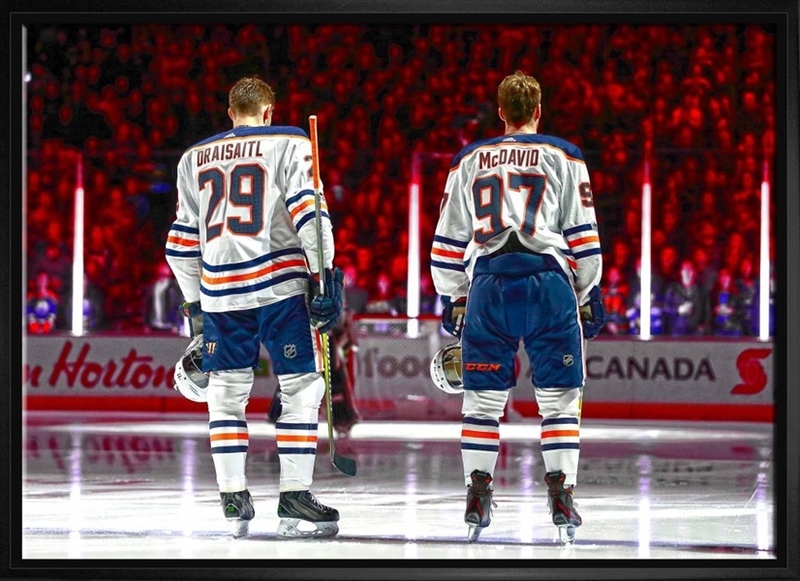 McDavid has 29 goals and 73 points coming into the All-Star Break and Draisaitl has 27 goals and 61 points. . This unique art print is officially licensed by NHL & NHLPA. The image has been printed on a canvas and is stretched and stapled on the back to a 3/4" deep wooden frame. Perfect for any home or office and a unique addition to any hockey collection. Finished Size: 22x31”.